The Atlanta Metropolitan Council, NLUS was founded in 1962 as a non-profit, group in support of the sea services and we try to make a difference in matters important to our National Defense. We work hard to Increase awareness of the diversity of the maritime units and the important role our sea services play in our national and regional security and further the understanding that maritime commerce is the cornerstone of our economy. Host informative meetings and gatherings. Sponsor visits to our military bases and support significant military associated events. Participate in local patriotic events: Memorial Day, Independence Day, Veteran Day, etc. Maintain Grassroots Legislative Affairs contacting 12 members of Congress in our area. 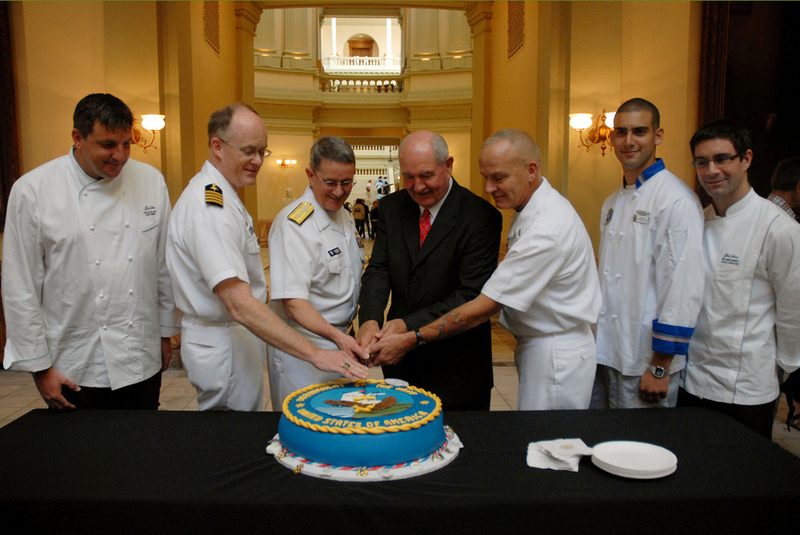 Sponsor the annual Atlanta Navy Birthday Ball every October. Have adopted two ships and two units: the USS Georgia (SSGN 729) and the USS Jimmy Carter(SSN 23) and the Undersea R & D Detachment, Navy Operations Support Center Atlanta and Navy Recruiting District Atlanta. Provide quarterly and annual recognition awards to top performing sailors and marines at our adopted units and host recreational and entertainment activities for sailors from the USS Georgia. Support nine Sea Cadet Corps units. Adult leaders teach a variety of basic skills, military discipline, leadership responsibilities to your people ages 11-17. We also support the Training Ship David A. Enright. Present 45 annual “Outstanding Cadet” awards to the best performers at 45 Navy/Marine Corps JROTC units end of school year banquets. We also host an annual awards banquet where we honor all 45 cadets and select the “Metro Cadet of the Year” and runners up. Award engraved Navy Swords to the top midshipman at Georgia Tech and Morehouse college. Navy for moms dinner meeting with special guest speaker RADM Michael yurina. Member welcoming a few of the USS Georgia sailors to Hartsfield Jackson International Airport. Members participated in the annual OLD SOLDIERS PARADE PARADE in Alpharetta GA . The council was honored to have 2nd Quarter Sailor of the Quarter, STG1 Rasheed Grant with Navy Recruiting District-Atlanta, one of our sponsored units. 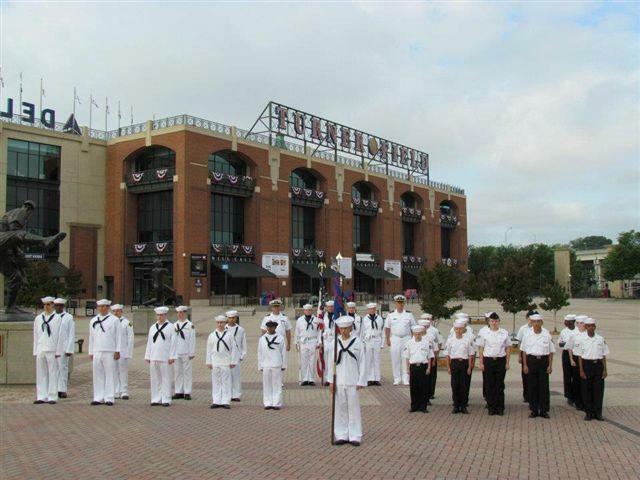 THE 1124TH CONSTRUCTION BATTALION sea cadets were chosen by the Atlanta Braves to provide the colors for the Braves home opener against the milwaukee brewers. The winner of the Schwendler Award Cadet of the Year of the Pathfinder Excursion Squadron and The winner of the JROTC Outstanding Cadet of the Year award (right) of Kennesaw Mountain High School NJROTC. Representives of the NLUS Atlanta Council meet with Congressman Hank Johnson (GA Dist. 4) to brief him on "Protecting Sea Lanes. Enabling America's Commerce, and Preserving Commerce and Preserving Peace: The U. S. Navy. Depicted, ( L-R) Atlanta past President Harley Jones, VP Youth Programs Dale Mastley, Contressman Hank Johnson, and VP for Legislative Affairs don giles. About 700 Air force, army, and navy JROTC cadets participated in the Cobb County and marietta city schools joing junior reserve officer's training corps parade and pass-in-review.ceremony. The reviewing Officer for the pass-in-review is Lieutenant General joseph redden (retired). CMDR Brian Elkowitz, Commanding Officer (CO) and CMDCM(SS) Eric Antoine, Captain of the Boat (COB) joined the Atlanta Council Board for an informal reception prior to the Council's November meeting and council briefing on Jimmy Carter and the USS Jimmy carter. four of the council's members together at the memorial day wreath laying, (L-R) Treasurer Robert Wise, JR, VP Legislative affairs don giles, NSCC Chair Jim serrate, and past president harley jones. SPECIAL GUEST SINGER TENOR TIMONTHY MILLER, KEYNOTE SPEAKER RADM MARTHA HERB, AND ATLANTA COUNCIL VP OF LEGISLATIVE AFFAIRS DON GILES AT THE COUNCIL'S ANNUAL YOUTH AWARD BANQUET. Council president Jeff alexander presented Midshipman Christopher O'Reilly with a Naval Officer's Sword for his outstanding performance in the NROTC program at Georgia Tech. brigadier general lawrence e. dudney, jr. commander of combined joint task force phoenix (Cjtf) fhoenix ix spoke about the role the georgia national guard was playing in afghanistan. council president Frank campbell presented a thank you gift.